Cross Movement & Friends present the Christmas story like you've never heard it before in Gift Rap. They invite a host of friends including Da' TRUTH, Flame, J.R, M.O.D. and J- Silas and Michelle Bonilla (Rock Soul) to share in the celebration of the Savior's birth on this soon to be Holiday classic. 3 - Happy Birthday To Who? 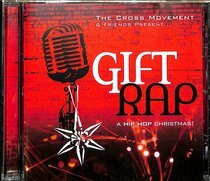 :Cross Movement & Friends present the Christmas story like you've never heard it before in Gift Rap. They invite a host of friends including Da' TRUTH, Flame, J.R, M.O.D. and J- Silas and Michelle Bonilla (Rock Soul) to share in the celebration of the Savior's birth on this soon to be Holiday classic.